1. Follow the Butterworth-Kulim Expressway (BKE) and head towards Kulim. 2. Go straight, past Kulim. 3. Go past the junction to Baling, DO NOT turn to Baling, go straight. 4. After a stretch of new mountainous highway, you will reach a cross junction with traffic lights. 5. Go straight, towards Kota Bharu. DO NOT turn to Gerik. 6. 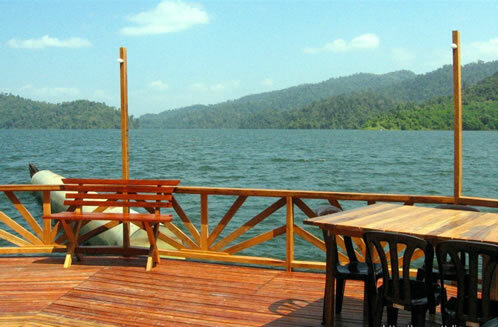 You will reach a bridge that crosses Temenggor Lake to Banding Island. Cross the first bridge. 7. After passing by a Petronas petrol station, you will reach another bridge. DO NOT cross this bridge. 8. There is a small road on the left just before the bridge, take that turn to Banding Island public jetty. 1. Use the North-South Highway (PLUS Highway) and head towards Ipoh. 2. Go past Ipoh towards Kuala Kangsar. 3. Exit at the Kuala Kangsar interchange and follow the road sign towards Gerik. 4. Go past Gerik, when you reach a round-about, take the turn towards Kota Bharu and Pulau Banding. 5. You will reach a T-junction, turn right towards Kota Bharu. 1. Use the East-West Highway and head west (towards Butterworth). 2. Go straight past Jeli. 3. 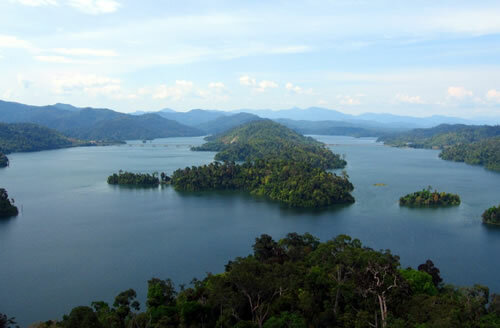 You will come to a bridge that takes you across Temenggor Lake, to Banding Island. 4. Right after that bridge, turn right into a small road that leads to the public jetty. From the public jetty, we will take you to our island by boat. Pickup time at the jetty is from 12:00pm to 1:00pm.